Approximate price. For latest deals & prices please check toy retailer websites. Lite Brix is the Super Building System where you can build light up environments and vehicles using Lite Brix, connectors, special shaped parts and brick blocks. At the LiteUp Sparkle Salon, creative Kaylee creates the most fabulous hair styles for all the girls on Sunset Island! Lighted building bricks feature four colour LEDs. Sparkle salon lights up with the battery power pack. Connector pieces attach the Lite Brix to each other. Multiple play areas include make-up, vanity table and styling salon. Includes Kaylee mini-doll figure; One supplied; Styles may vary; Size H25.5, W27.8, D4.8cm; Batteries required: 3 x AAA (not included). For ages 6 years and over; EAN: 884920357013. WARNING(S): Not suitable for children under 3 years old. * 1074080 34.99. Lite Brix Girls are a group of young, smart, and creative girls who will run the world someday soon!At the LiteUp Sparkle Salon, creative Kaylee creates the most fabulous hair styles for all the girls on Sunset Island, they cannot get enough! 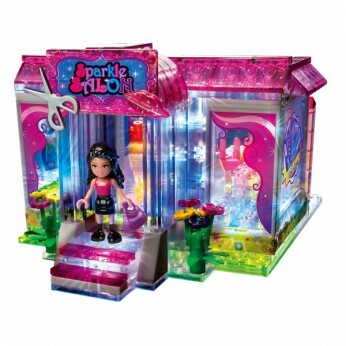 Build your own light up beauty salon and help Kaylee pamper the girls as they shop for cosmetics and hair accessories. This fabulous hair and beauty salon playset features multiple play areas including make-up table and styling station.Set includes 1 Kaylee mini-doll figure, accessories, battery pack and instruction manual. This toy costs approximately £29.99 (for the latest and best prices make sure you check our retailer list for the Lite Brix Lite Up Sparkle Salon above). In our review of Lite Brix Lite Up Sparkle Salon we classed it as being suitable for ages 3 years, 4 years, 5 years but recommend you check the manufacturer specific advice before purchasing. To leave a review please either login or become a member of ToyLike. Joining ToyLike is free and only takes a few seconds. As a member you will also gain access to our online community, forums and amazing competitions and prize draws!